Hey, coconuts!!! So, you’ve read the introductory article on Iris and you decided to take the plunge. You got yourself a sweet supporting hero–Iris. You’ve glossed her over, leveled her up, and you have some skill points to use…but where do you want to put them? Where do you even begin? Iris is 15, and like any teenager, tends to have her hands in a little bit of everything. So for now, think of her less as the main attraction when it comes to attacking, and more as the Robin to your Batman. Her synergies are where it is AT! Offensively, you are probably most interested in at least 3 of the 8 offered synergies. 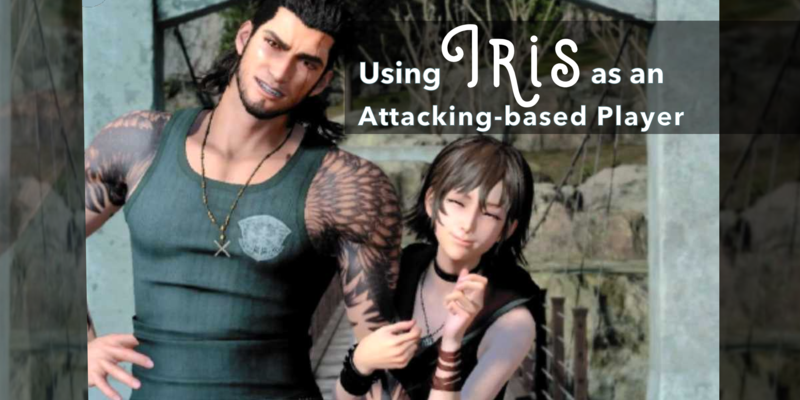 Now, there is already a guide to Iris, so let’s keep this one short and give you four main heroes to look at Noctis, Prompto, Ravus, and Gladio. If you are a crystal buff, put Ravus back to the front of your queue. Ravus came out strong when he was released, but all-too-soon was replaced by Prompto’s armor-shredding skills. Now, with Iris synergy boosts, his Troop attack and HP while attacking the crystal make him an excellent choice for taking over that enemy palace. Plus, he just looks too damn good to sit in the back. When mastered, Iris gives Ravus an additional 2,494,208% Troop attack AND 2,494,208% Troop HP. *Note, these boosts are only for attacking…so if you plan on holding the crystal, you will want to swap to a different hero to give you better boosts for defending. If you are a team player and enjoy attacking bigger targets, then Prompto is your snarky lil man! Already equipped with rally bonuses like shortened rally attack time and faster marches, Iris builds upon this by giving him an additional Rally attack and HP. Combine that with the new rally sizes and boosts that the Cit 90 release and Prompto 300 offers, and your rallies will be the deadliest you’ve ever seen. When mastered, Iris gives Prompto an additional 5,441,909% Rally Attack and 5,441,909% Rally HP boost! What once was an all-around, nothing special hero, has now become the Belle of the ball. If you have fun with your solo marches, then it is time to dust off Noctis and use him for something more than monster hunting, as Iris blesses Noctis with increasing the health of your core troops, which in turn gives ANY of your troops in the warrior/mage/calvary categories the boosts as well. With greater HP, you have more of a chance for survivors. If you have survivors, you can mix in some of the newer mercs, like Shadowstalkers, which will strengthen your attack–and yet they will still be safe from an untimely demise. (Unless your target is sneaky-sneak and holding out on you with last-minute various boosts/limit breaks. Yeah…you know who you are…) When mastered, Iris gives Noctis an additional 3,401,193% Troop HP.